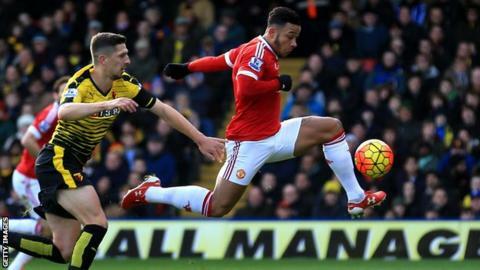 Troy Deeney's last-minute own goal gave injury-hit Manchester United victory over Watford at Vicarage Road. Deeney looked to have earned a point for the Hornets with a late penalty, but then slid home a Bastian Schweinsteiger cross. Memphis Depay - starting a Premier League match for the first time since 4 October - netted United's opener, volleying home an Ander Herrera cross. Odion Ighalo and Etienne Capoue fired off target for the home side. But, with just four minutes left, they made a breakthrough when Deeney smashed home after Marcos Rojo clumsily brought down Ighalo. The drama in an end-to-end second half was not over, though, as United pushed for a winner. They got their reward as Jesse Lingard's ball across the box fell to Schweinsteiger, who slid it back across goal and Deeney bundled home. Very well. United's injury problems up front - with both Wayne Rooney and Anthony Martial out - meant Depay was given his first league start since the drubbing at Arsenal on 4 October. Manager Louis van Gaal has said he expects more from his fellow Dutchman, and his faith here was rewarded. Depay sweetly struck the opener, showing calmness and composure to guide Herrera's cross into the roof of the net. Full of confidence, he tested Heurelho Gomes with a low drive shortly afterwards, and sent another two efforts wide of goal. Rooney has been entrusted with leading the line for the Red Devils this season, but he has scored just twice in the league, a tally now matched by Depay. Should he be fit, the captain will surely be restored to the side for Wednesday's home Champions League game against PSV Eindhoven, but where? On this showing, it may be better to leave a confident Depay up front against his old side, playing Rooney in the number 10 role, particularly as Herrera went off injured. United were in control for much of the game, and finished with 56.7% possession, but should have put the game to bed early on. Lingard was twice thwarted by Gomes when through on goal and the industrious Morgan Schneiderlin firing narrowly over. Watford grew into the game and forwards Deeney and Ighalo caused them some problems in the second half. They found visiting goalkeeper David de Gea in fine form, though, and it took a penalty for them to get past the Spaniard. De Gea - playing against a side managed by Quique Sanchez Flores, who gave him his debut for Atletico Madrid - made five crucial saves, including a stunning reaction stop from Almen Abdi's deflected strike. Deeney's spot-kick ended United's run of 641 minutes without conceding. The Hornets may have lost back-to-back league games for the first time this season, but they posed a real threat to title-chasing United. Having been tipped for an immediate return to the Championship, they are seven points above the relegation zone after 13 games and showed their fighting spirit. Spaniard Flores took over in the summer and has put together a well-drilled side who are organised and work hard for each other. The introduction of midfielder Nathan Ake at half-time provided them with more bite, as the on-loan Chelsea man made six tackles, more than any other player on the pitch despite playing only 45 minutes. They do not concede many goals - just 14 in the league so far this season - but with only 12 scored at the other end, they will need to be more clinical if they are to remain in the top flight. An impressive return to the first team for the Dutchman - but can he maintain his good form? Watford manager Quique Sanchez Flores: "We deserved a draw in the second half. It was difficult to play with the wind in the first half, same for them in the second half, but this is football. "We tried in the first half but we could not. At half-time we had to forget and play a match for 45 minutes." Manchester United boss Louis van Gaal: "It was a short time to play after the penalty but you have seen also the spirit of my team. It was amazing because even after the penalty we gave another injection into the game. In five minutes we had possibilities and scored a goal, that was the consequence of the spirit. "I am very happy for Bastian Schweinsteiger. He needed a goal, he got it and Memphis Depay also scored a beautiful goal. I am a happy coach." Watford travel to bottom side Aston Villa next Saturday, while United play PSV Eindhoven in the Champions League on Wednesday. Match ends, Watford 1, Manchester United 2. Second Half ends, Watford 1, Manchester United 2. Attempt saved. Odion Ighalo (Watford) right footed shot from the centre of the box is saved in the centre of the goal. Assisted by Almen Abdi with a headed pass. Own Goal by Troy Deeney, Watford. Watford 1, Manchester United 2. Attempt missed. Bastian Schweinsteiger (Manchester United) right footed shot from the right side of the six yard box misses to the left following a corner. Attempt saved. Jesse Lingard (Manchester United) left footed shot from the left side of the box is saved in the bottom right corner. Assisted by Andreas Pereira. Corner, Manchester United. Conceded by Heurelho Gomes. Attempt saved. Chris Smalling (Manchester United) right footed shot from the centre of the box is saved in the top left corner. Assisted by Andreas Pereira with a cross. Corner, Manchester United. Conceded by Ikechi Anya. Goal! Watford 1, Manchester United 1. Troy Deeney (Watford) converts the penalty with a right footed shot to the high centre of the goal. Penalty conceded by Marcos Rojo (Manchester United) after a foul in the penalty area. Penalty Watford. Odion Ighalo draws a foul in the penalty area. Foul by Memphis Depay (Manchester United). Juan Carlos Paredes (Watford) wins a free kick in the defensive half. Attempt saved. Jesse Lingard (Manchester United) right footed shot from outside the box is saved in the centre of the goal. Assisted by Daley Blind. Delay in match Ashley Young (Manchester United) because of an injury. Offside, Manchester United. Marcos Rojo tries a through ball, but Jesse Lingard is caught offside. Substitution, Manchester United. Andreas Pereira replaces Juan Mata. Offside, Manchester United. Memphis Depay tries a through ball, but Jesse Lingard is caught offside. Foul by Morgan Schneiderlin (Manchester United). Etienne Capoue (Watford) wins a free kick in the attacking half. Foul by Bastian Schweinsteiger (Manchester United). Attempt saved. Troy Deeney (Watford) right footed shot from the centre of the box is saved in the bottom right corner. Assisted by Odion Ighalo. Ashley Young (Manchester United) is shown the yellow card for a bad foul. Foul by Ashley Young (Manchester United). Juan Carlos Paredes (Watford) wins a free kick in the attacking half. Corner, Manchester United. Conceded by Ben Watson. Foul by Patrick McNair (Manchester United). Corner, Watford. Conceded by David de Gea. Attempt saved. Almen Abdi (Watford) right footed shot from the left side of the box is saved in the bottom left corner. Attempt blocked. Etienne Capoue (Watford) left footed shot from the centre of the box is blocked. Assisted by Odion Ighalo. Substitution, Manchester United. Patrick McNair replaces Phil Jones because of an injury. Substitution, Watford. Juan Carlos Paredes replaces Nyom. Delay in match Phil Jones (Manchester United) because of an injury. Ben Watson (Watford) is shown the yellow card for a bad foul.